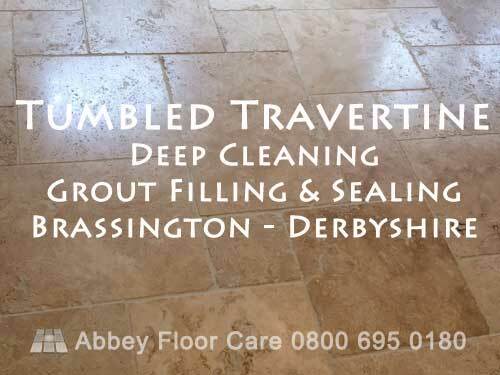 This article is about cleaning tumbled travertine tile floor, we recently completed in Brassington, near Matlock in Derbyshire. We were contacted because the homeowner had recently purchased the property and she wanted the travertine floors cleaning and sealing. The new owners were also concerned that the soil was contributing to a strong “doggy” smell in the property. The “doggy smell” may have been contained in the soil because dog oil from their body can build up on the floor. Over time the body oil starts to oxidise and go rancid, just like butter, giving off a strong unpleasant smell. So they hoped that the smell would go after the cleaning tumbled travertine tile. The homeowners specified that the floor was sealed with an impregnating sealer as the floor needs to breathe because there is no damp proof membrane. We started by applying a soil remover and left it for 30 minutes to soak into the floor. Scrubbing the floor with a medium brush and gentle abrasive cleaning powders. The cleaning powder helps agitate the soil out of holes and crevice without scratching and damaging the surface of the tiles. 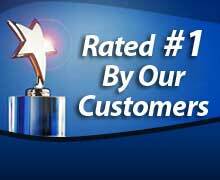 The cleaning was followed with our hot water pressurised “no-mess rinse and capture” equipment. Hot water is sprayed onto the surface of the floor at 1,000psi. The pressure turns the hot water into a strong scrubbing solution, lifting embedded soil off the floor. The slurry is immediately vacuumed out of the house into our truck mounted recovery tank. The cleaning also has the benefit of removing loose filler that will come loose over the coming months. 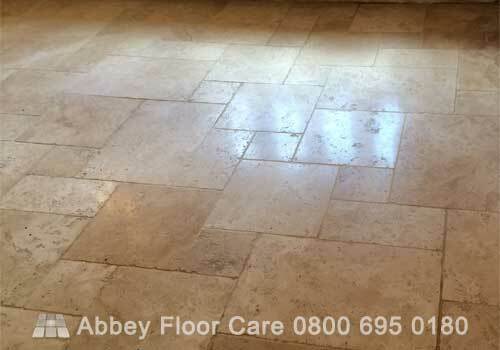 We gave the floor a light polish using marble polishing powder. The polishing makes the tiles smoother and so easier to dry sweep and mop. The floor was then finish rinsed and vacuumed dry using our truck mounted vacuum generator. We used Mapei Jasmine grout to re-fill the holes. The grout was allowed to dry overnight, leaving the floor ready for sealing. 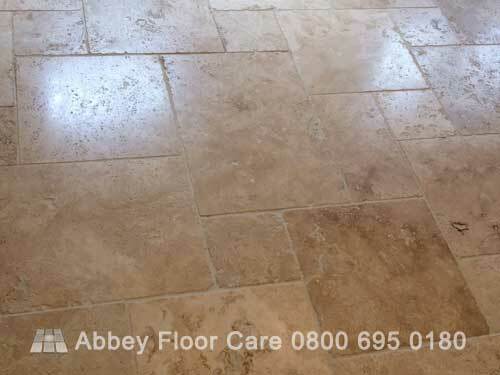 We sealed the travertine tiles with a high quality colour enhancing impregnating sealer. 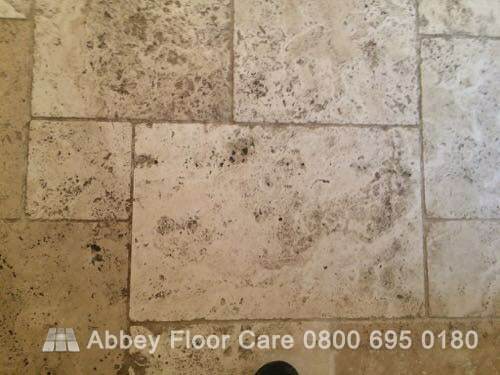 We also provided the guidance on cleaning a travertine floor and with a microfiber mopping system and the right travertine cleaning solution. 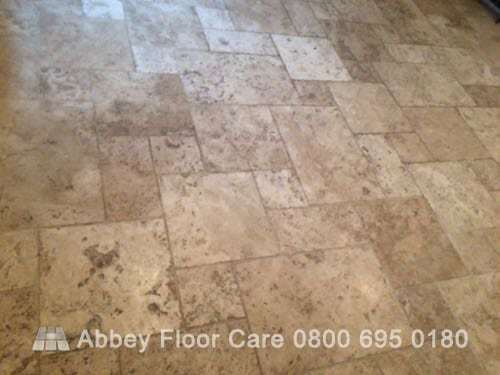 This means that the travertine will stay cleaner for years rather than months. 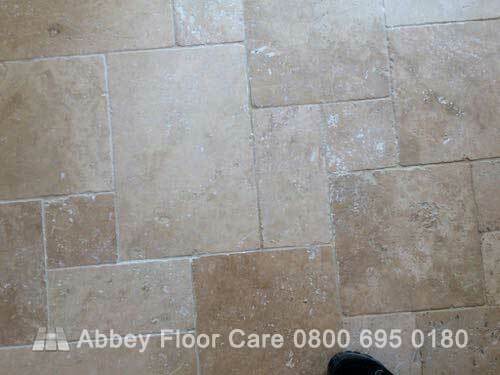 If your tumbled travertine floor needs cleaning, please click here to contact us, we will be happy to help.